I love musicals, and if you are reading this blog there is a good chance that you do, too. But believe it or not, the musical is a fairly controversial mode of story telling. Not everybody is OK with a character violating all social norms and standards of sanity by suddenly bursting into song. (But how else can we learn what a character wants in life or get the entire back story before the end of the first scene? A montage? I think not!) And nowhere has this controversy been more contentious than in Hollywood. The history of the Hollywood musical is one of meteoric rise, a humbling downfall and a gradual return to greatness with lessons learned. In fact, it sounds like a good plot for a musical! Seeing as the Tams-Witmark catalog includes so many titles that are as well known on film as they are on stage, we thought it might be worthwhile to delve into the past, present and future of musicals on the screen. So enjoy this little history lesson and let us know if you have anything to add. From the very first feature length “talkie”, 1927’s The Jazz Singer, Hollywood was all musicals all the time. These early musical films featured little of the naturalism that defines most contemporary cinema; instead they served up grand, theatrical affairs for audiences that were already well-accustomed to stage musicals, radio shows, and vaudeville. The movie musical was a way for audiences and creators alike to ease into an unfamiliar medium with a familiar genre. Film studios in the early 30’s competed to outdo one another with over the top spectacles, churning out a glut of formulaic musical revues. However cash strapped audiences suffering through the Great Depression quickly tired of such repetition and demanded more. Enter Busby Berkley, a Broadway dance director snatched up by Warner Brothers to save the movie musical from obscurity. Berkley’s major innovation was to set his cameras in motion using custom built booms and monorails, making the audience/camera a part of the choreography. This new technique stunned and excited audiences as a part of Warner Brothers’ hit 1933 film Forty Second Street. As other studios replicated the Berkley style throughout the 1930’s dance became a more important component of movie musicals than ever before (or ever again). This focus on dance also increased the importance of the individual dancers. Each Hollywood studio had its own stars on contract, perhaps none more remembered than RKO’s Fred Astaire and Ginger Rogers. This dynamic duo starred in movie musicals throughout the 1930’s, such as The Gay Divorcee and Top Hat, setting the standard for movie musicals, and inevitably establishing a new formula. Movie musicals hit their peak popularity in the 1940’s when a war weary populace flocked to the theatres for a fun and glamorous diversion. In 1945, the year of the war’s end, six of the top ten box-office hits were musicals. But the 1940’s were also a golden age for the craft of the movie musical. A new generation of talent, both in front and behind the camera, crafted complex characters and stories that increasingly used song, dance and music as an integral part of the narrative, rather than a mere diversion. By the late 50’s, the invention of television was cutting into the popularity, and thus the profits, of Hollywood. For better or worse, the studios became reluctant to invest in original musicals and the trend of Broadway adapting movie musicals began to reverse itself as Hollywood increasingly looked to the stage for source material. To be fair, Hollywood’s reliance on Broadway resulted in more than a mere recycling of old material and in a number of instances resulted in enduring films that rivaled the stage version in the public’s imagination. In 1968, Barbara Streisand won an Academy Award when she reprised her role as Fanny Brice in the film adaptation of Funny Girl. 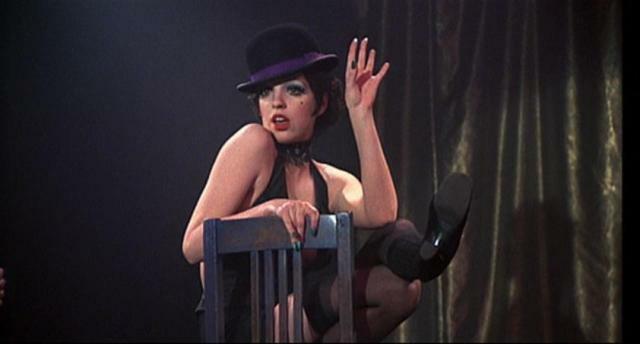 And Bob Fosse repeatedly demonstrated the stage musical’s cinematic potential by directing film adaptations of Sweet Charity and Cabaret, for which he won an Academy Award as well. However, despite a number of film musical gems to emerge in the 60’s and 70’s, film studios mostly struggled to translate the magic of Broadway onto the silver screen. Man of La Mancha, Finian’s Rainbow, and Mame all stalled at the film box office. Cinematic sensibilities were beginning to diverge from those of the stage musical. Popular films such as Bonnie and Clyde, The Graduate and Easy Rider defined a new era of Hollywood that was grittier, darker and more naturalistic. By the 1980’s, the only film characters to break out into spontaneous song were of the animated variety. Disney built a film musical empire, often featuring the music of acclaimed Broadway writers like Stephen Schwartz and Alan Menken, but in regards to an adult audience it was once again looking like the movie musical was done for. Hollywood has continued to adapt stage musicals in the 21st century, although with mixed results. Dreamgirls and Chicago each won over audiences, and Chicago even became the first film musical to win the Academy Award for Best Picture since Oliver! received that honor in 1969. However, these successes were far outnumbered by disastrous flops such as Rent, Annie, Nine, and Rock of Ages. The real 21st century surprise has been the comeback of original musicals for the screen, especially in the unlikely medium of television. Unlike the often self-serious tone of many recent film musicals, television has embraced the poppy, and even sometimes campy side of the musical. Shows like Nashville or Empire take place behind the scenes in their respective music industries (country music in the case of Nashville and hip-hop for Empire), much like the golden age movie musicals that were often set behind the scenes of a Broadway show. Other shows, such as Smash and Glee, go even further in their embrace of musical theatre tropes by straying into the surreal and fantastic when a character is in the midst of song. Television’s use of the musical form is often characterized by a post-modern, almost ironic sensibility. The heightened drama and extreme sincerity involved in expressing emotion through song is not a natural fit for today’s audiences, but a new generation of creative talent has rediscovered the comedic potential available when the campiness of the musical form is embraced and even exaggerated. Shows like HBO’s Flight of the Conchords or Trey Parker and Matt Stone’s film adaptation of their scatological television series South Park, simultaneously satirize musical theatre and rely on it as an essential part of their comedy.